There’s no stopping the forward march of progress, and cities have to grow to keep up with the changing world, but sometimes that growth can be hard to watch. Particularly when it’s designed in the local vernacular, older architecture has sentimental value, standing as tangible reminders of decades and even centuries past and reflecting the history of a specific neighborhood. In our modern age of rapid urbanization, streets that were once quiet residential havens can become bustling thoroughfares full of skyscrapers virtually overnight, and developers have few incentives to preserve aging structures when towering buildings full of pricey condominiums offer the biggest possible return on their investment. But for locals, seeing historic architecture disappear – especially when it represents a particular culture that has been pushed out of the neighborhood – can feel like a terrible loss. We want our futuristic cities full of high-density solutions that curb urban sprawl, but many of us also want to see the character that makes our neighborhoods what they are preserved through all the changes. 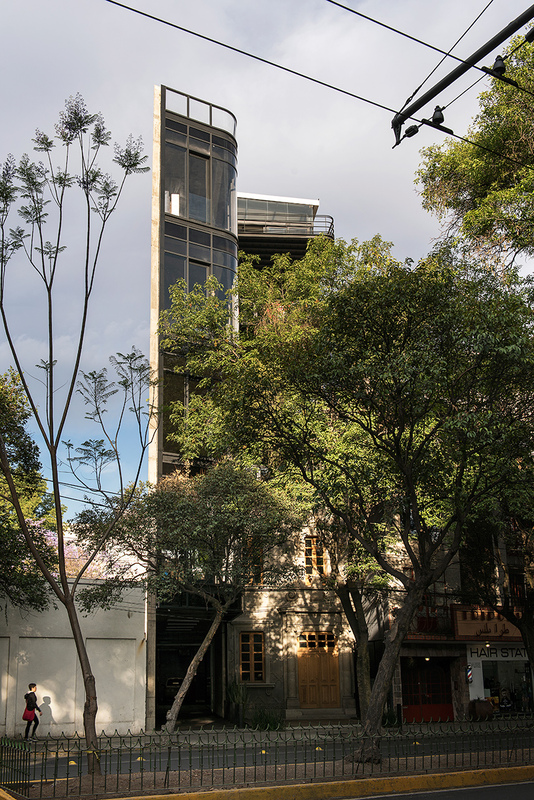 This expansion in Mexico City’s historical Colonia Condesa district is one example of how we can promote the preservation of buildings that aren’t historic enough to have protected status through the government. While most of the original structure was removed to allow for nearly 30,000 square feet of additional office space for the city’s growing population, its facade was integrated into the design of the new building. 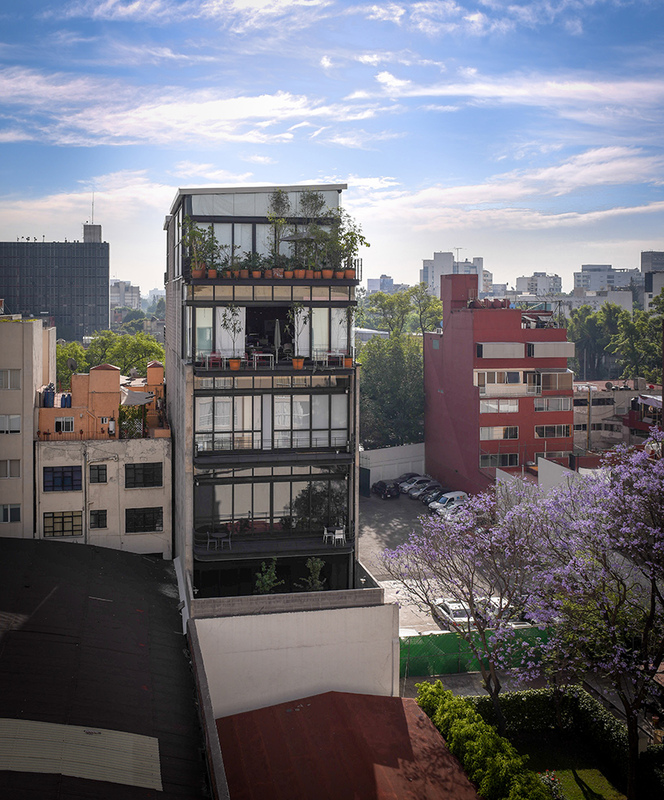 The Sonora 113 project by Mexican architect Iñaki Echeverria rises six stories into the air from its tiny original plot, upon which the little house stood. 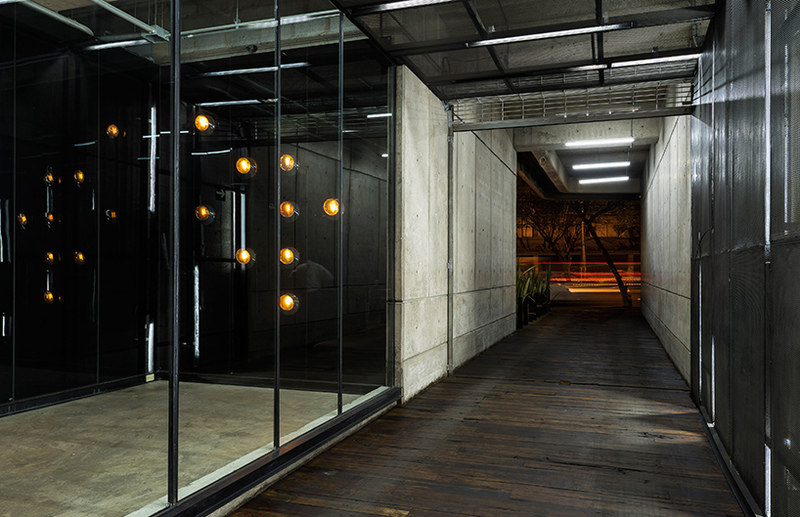 The new structure provides workspace for creatives like interior design and architecture firms as well as advertising agencies. Taking up just 26 feet of street-facing width, the new structure wraps around the old, maintaining a restrained color palette of coated steel, glass and concrete so the beautiful facade patterns and wooden trim still shines. The restraints of the tiny plot required the facade of the extension to be pushed out all the way to the sidewalk, which does sort of engulf the old house, making it feel boxed-in. 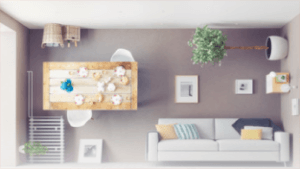 The overall effect, then, is one of a ‘holdout house,’ known to developers as ‘spikes’ – tenacious structures that evade being demolished to make way for incongruous new projects so they end up being squeezed on all sides. The most famous example of a ‘holdout house’ is Edith Macefield’s ‘Up House’ in Seattle, which served as inspiration for the animated film of the same name. 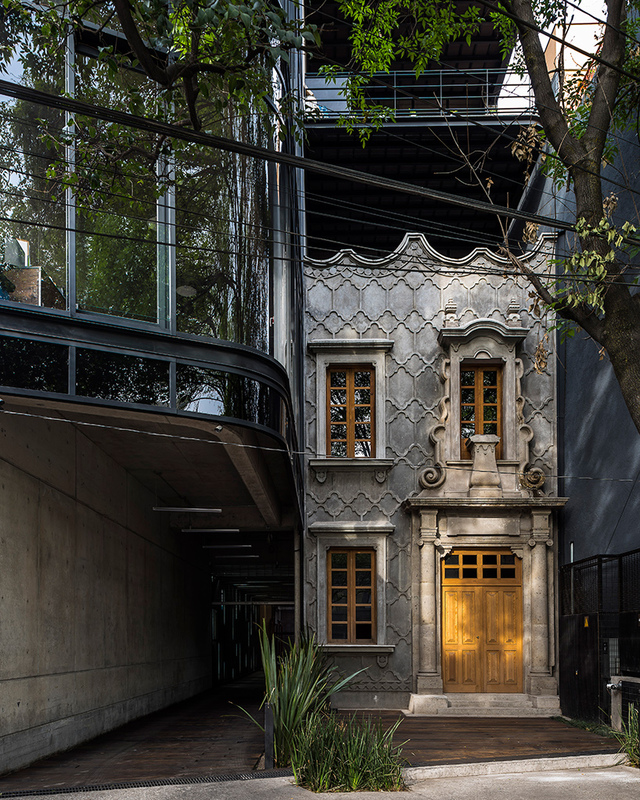 Not all older architecture still has this much value so long after it was originally built, especially when we’re talking about all of the cheap structures that went up in the ‘70s and ’80s, but clearly this Mexico City house is unique and deserving of its place of honor on the street. Maintaining a mix of architecture from various eras makes cities more interesting, and helps ease the growing pains we often feel during rapid transitions.